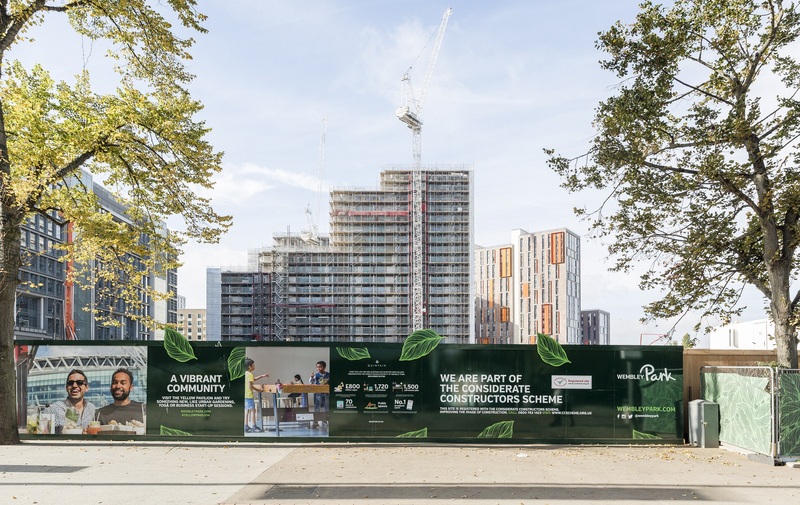 With eye-catching branded hoardings telling the story of Wembley Park’s rich history, as well as detailing its exciting future, Quintain is projecting a striking image for the industry. Quintain Ltd is considerately transforming the 85-acre area surrounding Wembley Stadium and the SSE Arena for its Wembley Park development, creating a major new neighbourhood and destination for London. Bringing new homes, retail, leisure facilities and public spaces to this landmark site, Quintain recently announced plans to deliver almost 5,000 rented homes which would make it the biggest Build to Rent Fund scheme in the UK. The ongoing development has already proved its considerate credentials by scooping five Considerate Constructors Scheme National Site Awards for various phases of the work since 2010. To achieve and maintain its immaculate, professional and eye-catching appearance, Quintain created one coherent and standardised approach to branding on site. This incorporated the brand identities of the CCS and all contractors involved in the development framework, namely Carillion, McLaren, John Sisk & Son Ltd and Wates, as well as McAleer & Rushe and O’Keefe. Excellent first impressions were further enhanced by clear and plentiful signage and an extremely clean and well organised site, with materials precisely stacked in a uniform fashion in dedicated areas. Plant was similarly clean, well maintained and neatly positioned and the appearance of the workforce supported this ethos, with operatives wearing branded PPE and full-kit wet weather clothing, all uniform in appearance. “Over the last decade Quintain has invested more than £900m in Wembley Park, with London Designer Outlet, 1,000 homes, the refurbished SSE Arena, Wembley and a new 4-star hotel, public square and playpark. “As we move into the next exciting phase of the Wembley Park redevelopment, we are determined to manage a positive culture at Wembley Park and minimise the impact of construction work. “The Considerate Constructor Scheme’s Code of Considerate Practice has been an invaluable resource to help guide our approach to site maintenance and community relations. 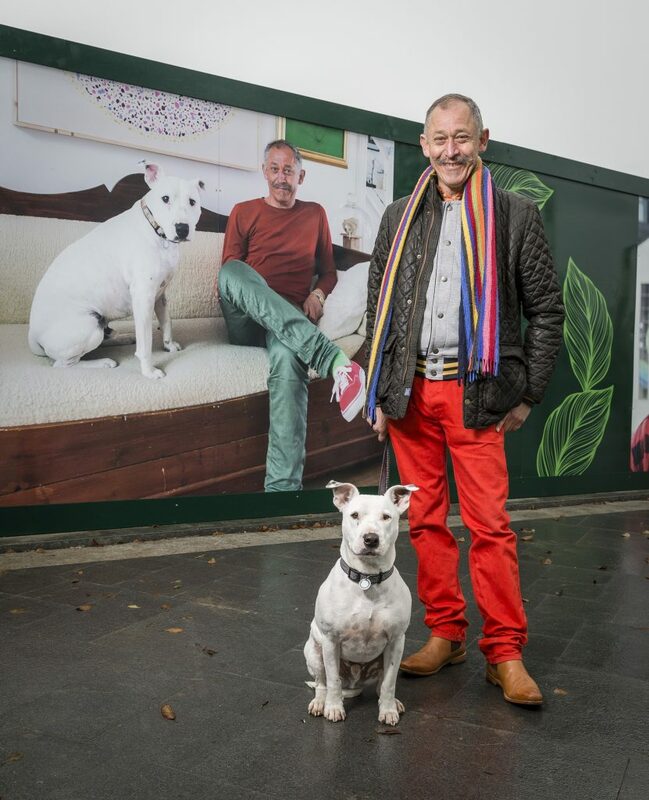 One of the exciting ways Quintain forged meaningful links with the community was by using hoardings to display Quintain’s ‘People of Wembley Park’ project. artists, entrepreneurs and managers. The hoardings also illustrated people who have been in the area for generations, as well as those who have arrived more recently. This project is an example of Quintain’s commitment to a community-led development. The most significant redevelopment of the area in nearly a century, construction will be at an unprecedented pace, with over 3,000 homes under construction by the end of 2017 and funding and planning secured. While the works will benefit residents, neighbours and visitors alike, Quintain aims to minimise disruption, and improve the face of construction, whilst at the same time delivering a first-class regeneration project. This coherent and community-focused approach also goes beyond hoardings – Quintain has implemented a strategy to develop a core skills programme that has brought all the contractors on site together. To increase the level, range and depth of local people’s skills in order to enable them to make the best use of opportunities at Wembley Park. This will enhance the local economy by providing a trained workforce who will support businesses in the area as well as attracting new businesses to relocate to Wembley Park. To create a tangible legacy from Quintain’s investment in the area, with a skills programme targeted at every level, from local residents to trades and businesses, from schools to tertiary education. Construction talks, site tours, community construction skills, such as an ‘Ask the Expert’ forum. Curriculum-based support for local schools and online resources for all local schools to access. Site tours to provide schools and construction students with an insight into the works. Client Partners are companies or organisations who make a pledge to improve the image of the construction industry by recommending Scheme registration to all of their sites. They encourage compliance with all aspects of the Code of Considerate Practice. An established partner of the Scheme, Quintain has been registering its projects with the CCS since 2006, forging an even closer relationship in November 2016 when it became the Scheme’s 51st Client Partner.